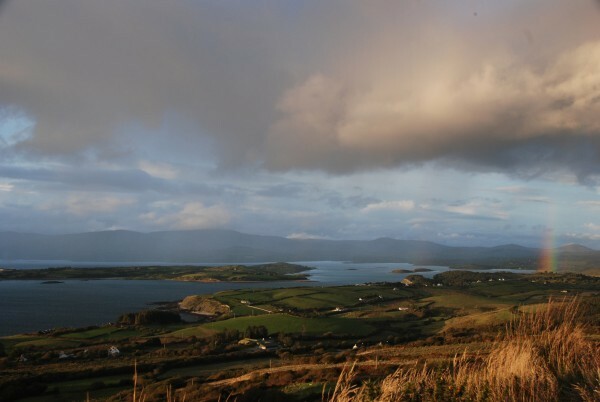 You’ll enjoy the wonderful views over patchwork fields and moorlands as you walk you walk the quiet roads around Durrus and explore country tracks with views over Bantry and the West Cork hills. To begin the Barnageehy Loop Walk, drive from Durrus village to the Car Park at Barnageehy. Take the old creamery road from Durrus, passing Wiseman’s Hardware Store, and continue on along this road until you reach the N71 and take a right here. The N71 will take you all the way uphill until you reach the car park at Barnageehy. At the Sheep’s Head Way finger post sign, turn right into the car park. There is a sign for Glanlough there also. To reach Barnageehy from Bantry, drive from Bantry taking the N71 passing The Westlodge Hotel and the turn off for The Sheep’s Head peninsula en route. Turn right at the junction for Skibbereen and Ballydehob and the N71 will take you all the way uphill until you reach the car park at Barnageehy. At the Sheep’s Head Way finger post sign turn in to your right to the car park, there is a sign for Glanlough there also. From the car park at Barnageehy set out along the road in a westerly direction following the yellow walking man way markers. At way marker no. 634 turn left off road and continue on up a track in a southerly direction at first before heading in a southwesterly direction with forestry on your left as you ascend. When you reach way marker no. 619, turn right here to descend down to the public road going over a timber stile, way marker no. 603. Turn right here and follow the road back to the car park at Barnageehy passing by a timber stile, way marker no. 600 and a gate with an information sign on it enroute. Note : Be aware of weather conditions and cut away peat bogs along the loop walk. Be aware of any livestock on the land, especially any Bulls. Please do not exit marked trails only on marked routes. No dogs are allowed on the Sheep’s Head Way. The Barnageehy Loop Walk is one of 20 colour-coded Sheep’s Head Way loop walks. Start/Finish: Durrus Trailhead and drive to the Barnageehy car park. The route passes Bantry House, ringforts, ruined farms, and a holy well. The views out over Bantry Bay and Whiddy Island are lovely to behold. From the bustle of Bantry square to the green trails of the Sheep’s Head peninsula, this is an absorbing and satisfying West Cork walk. To complete the Rooska Loop Walk, set out from the Bantry West trailhead, set out along the N71 and, at way marker no. 1, turn left and continue along until stone way marker no. 678 (on back of stone) and turn right taking the north option. When you reach the N71 again keep left and continue on again for a short distance until you go off road at way marker no. 4. When you arrive again onto the N71, take the option for ‘Dromclogh’ at the finger post sign (way marker no. 5) after crossing the road. Continue on along the road again until way marker no. 6 and turn left off the road. You will stay off road until way marker no. 22. Follow the road along until way marker no. 25 and turn left. Continue on up the road, and at the T-junction, take a right as per the finger post sign for Boolteenagh, way marker no. 26. Continue along until you reach the car park at Boolteenagh. At way marker no. 31 set out off road in a southwesterly direction along the ridge passing Lough Na Fuilla (Lake of the Blood) on your left before you reach way marker no. 49. Turn right here and follow a track (the old lake road) in a northwesterly direction which will eventually lead onto a tarred road at way marker no. 2. Continue down along the road until it meets the main public road at way marker no. 1 (the finger post sign for Lough na Fuilla and Rooska West) and turn right. Keep along the main road until you reach way marker no. 25 to complete the loop. From here on follow the way markers back to where you came from and you will eventually arrive at the Bantry West trailhead. The Rooska Loop Walk is one of 20 colour-coded Sheep’s Head Way loop walks. It’s an exhilarating walk out to the very tip of the Sheep’s Head peninsula where you’ll get to take in stunning views over West Cork’s bays and peninsulas. The Sheep’s Head Way is an 88km walking trail along the coastline of Ireland’s Sheep’s Head peninsula – a European Destination of Excellence – and the lighthouse loop walk is one of the best ways to experience the trail for experienced hikers and day trippers alike. To begin your walk, drive down the Sheep’s Head peninsula until you reach the Cupán Tae tea shop. The road on the peninsula ends here at the Tooreen trailhead where your West Cork walk begins. From the car park at Tooreen follow the blue loop walk arrows. Set out in a southwesterly direction on the Dunmanus Bay side of the peninsula. Your route leads you past rocky outcrops and Lough Akeen and brings to the lighthouse at the tip of the headland. After the helicopter pad, the Sheep’s Head lighthouse comes into view and if you wish you can climb the concrete steps that lead up to it! 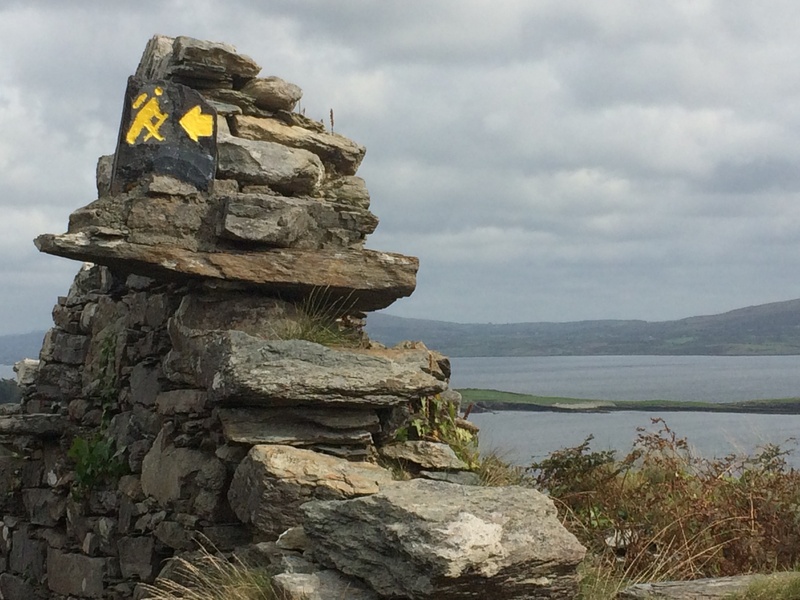 If you carry on around the peninsula’s north side, views open out over Bantry Bay and there are some spectacular sea cliffs alongside the trail. 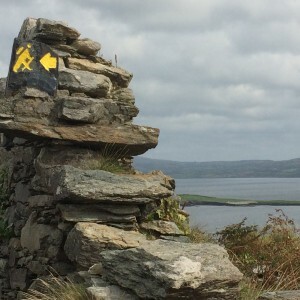 The loop – one of 20 loop walks on the Sheep’s Head Way – returns on the Bantry Bay side and at the Daingean (fort) sign near waymarker no. 272, veer right here off the main route which leads you back to the Bernie’s Sheep’s Head café and the car park at Tooreen. Note: Be aware of weather conditions, unprotected dangerous cliffs and cut away peat bogs along the loop walk. Please do not exit marked trails only on marked routes. No dogs are allowed on The Sheep’s Head Way. No trip to this walk is complete without a pause at Bernie’s Cupán Tae! Start/End Point; Car park at the end of the road on the Sheep's Head peninsula. Terrain: Footpaths, tracks and paved lanes. Steps down to the lighthouse, and close to cliffs. Facilities: The walk begins and ends at the Cupán Tae tea shop. Car park and toilet facilities are available here.